... as I've just finished another design in the charting software. This one will take me forever and a day to stitch, but it's going to be fun! It's a huge design, over 40,000 cross stitches and lots of specialty stitches. I decided to go with the Picture This Plus Huntress for it, and I think for this one I'll go with Hand Dyed Fibers for the threads. The possibilities are limitless though, you could do any colours you wanted it and it would look pretty darn cool. This makes the decision about which will be next pretty easy - Celtic Snow is nowhere near ready to stitch yet. The knotwork border is done, and I've got a few snowflakes designed, but that's about it for the moment. I'm taking a couple days off charting now - my wrist is killing me from drawing in all the details on this one!! I've also added a new page to my blog, listing conversions for my designs, see the link at the top. I figured rather than blog them, I'd just put them somewhere all together and easily accessible. I'll be adding to this page frequently as I get a request or as I feel inspired to do so! And with that, Zuma Blitz is calling. That is a very pretty design. I was just thinking about all the cool fabric you could use in this project. just when I convinced myself that Hearts Entwined was to have been the last new start... Geee Thanks Nicole, this is a very pretty design even though I am not a flowery stitcher I bet I could handle that for this one.... Very Pretty. and when is it out for sale??? Jayne, you have lots of time to finish Hearts Entwined before this one comes out. I'm aiming for a late summer/fall release. 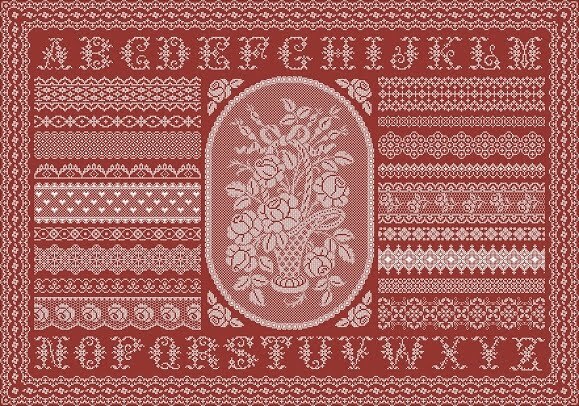 Kelly, one of the things I love about monochromes and/or sampler style designs is that you can really personalize them to suit your own tastes.